Manka Dhingra is counting on fellow Democrats’ frustration over state issues and alarm over Trump to propel her to victory in the 45th District. The Eastside race has drawn the kind of attention that usually elects people to Congress, not to a part-time state Legislature. By late afternoon last Election Day, the Champagne had already been uncorked at Manka Dhingra’s Redmond home, as she and her guests prepared to celebrate the first woman president. But instead of victory bubbles, the day wound into a long, mind-bending night many Democrats, polls and pundits couldn’t have imagined: President Donald Trump. That disbelief and disappointment launched into politics the attorney and advocate for domestic-violence survivors and mental-health patients and their families. Now Dhingra, 43, is in the final weeks of the highest-stakes state legislative race in recent years. 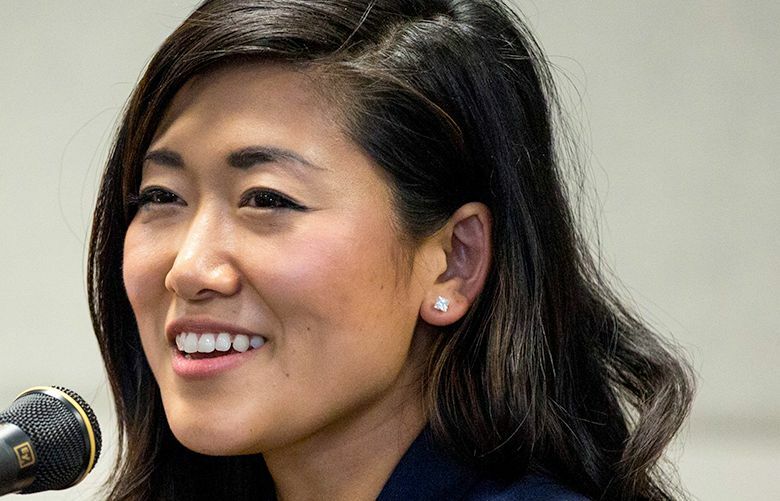 The contest between Dhingra and Republican Jinyoung Lee Englund in the Eastside’s 45th District will likely determine whether a GOP coalition keeps its one-vote edge in the state Senate — or whether Democrats claim both chambers in the Legislature as well as the governor’s office. Those stakes have drawn the kind of money and attention that usually elects people to Congress, not to a part-time state Legislature that pays $47,776 a year. The two candidates and the independent political spending groups have so far raised or spent more than $6.6 million. Dhingra is counting on Democratic frustration over seeing much of their agenda die in Olympia — combined with their alarm over Trump — to propel her to victory. She broke 50 percent in the August primary, beating Englund by 10 points. The 45th District includes Duvall and Woodinville, as well as parts of Kirkland, Redmond and Sammamish. Susan Hutchison, chairman of the Washington State Republican Party, said Dhingra and a Democratic-controlled Senate will be a blank check for Gov. Jay Inslee, and eventually will push for a state income tax. Dhingra has said she supports a capital-gains tax, but has repeatedly said she doesn’t favor an income tax. The GOP and Englund aren’t buying it, and have made the specter of an income tax a centerpiece of their campaign. “The Democrats have never found a single tax they don’t like,” Hutchison said. For Dhingra, who like Englund is making her first run for public office, the idea to enter the race came in bits and pieces, as she spoke with others and attended community events. The big push came over coffee with Redmond City Councilwoman Angela Birney, a friend and former neighbor. Birney pressed Dhingra to run for the Senate seat, which came open with the death of Republican state Sen. Andy Hill a year ago. Born in India, Dhingra came to Washington state more than two decades ago. She talked in an interview about her parents and early life in Bhopal, the site of the infamous Union Carbide industrial disaster. Her father worked there for Union Carbide, she said, though her family moved away to other cities in India before the pesticide plant’s catastrophic gas leak that killed thousands. By the time her father developed colon cancer, much of his side of the family had moved to California, she said. At 13, after his death, Dhingra and her mother — a teacher — joined the family in California. While attending the University of California, Berkeley, her boyfriend — now her husband — moved to the Seattle area to work for Microsoft. After graduating, Dhingra entered law school at the University of Washington, and the couple moved to Redmond. While planting roots on the Eastside, she founded Chaya, an organization that helped South Asian women who had experienced domestic violence. The group is now known as API Chaya. In June 1997, she began a clerkship with state Supreme Court Justice Barbara Madsen, and later did an internship with the state Attorney General’s Office. With a law degree in hand, Dhingra got a job in 2000 with the King County Prosecuting Attorney’s Office, where she still works. Her husband is now an engineer for SpaceX, Elon Musk’s rocket-building enterprise. At the prosecutor’s office, Dhingra has helped expand a mental-health court, as well as a veterans court and other diversion work. The courts allow some people charged with misdemeanors and felonies like property crimes or assaults to go through supervised treatment. Dhingra said she had seen herself as a trial attorney, prosecuting murder cases. But she was surprised by how much she like working in the mental-health court. But Dhingra had to convince a few skeptics that the mental-health court was worthwhile. Several years ago, she gave a presentation at NAMI Eastside, a nonprofit mental-health-advocacy organization. The group’s board members wondered whether the court would simply recycle people through the criminal-justice system, recalled former board member Paul Beatty. But Dhingra impressed Beatty, and he spent a couple of years trying to recruit her to the nonprofit’s board, he said. She joined the group in 2009, and remains a member. Republicans and independent political groups have turned her résumé against her, noting that Dhingra hasn’t worked full-time as a prosecutor since 2003. Instead, she’s worked part-time to help raise her family. She’s paid for 16 hours a week, but Larson said Dhingra works more than that. 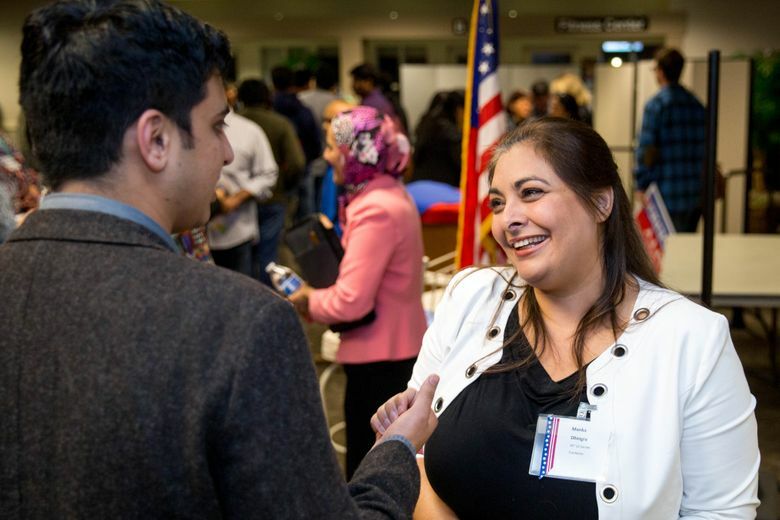 For Washington’s Democrats, divided government in Olympia has been a painful reality — and they’re counting on Dhingra to ease the frustration. Holding a one-vote majority, Senate Republicans — aided by a conservative Democrat — have nixed a range of tax proposals to boost funding for education and have stymied Inslee’s proposals to fight climate change. At a recent debate at Redmond’s Microsoft campus, Dhingra promised a cascade of proposals if elected. She offered to sponsor a bill to require that health plans offer contraceptives at no cost. She said she’d push for a ban on bump stocks that make semi-automatic, assault-style rifles fire like a machine gun. And she vowed to make it harder for people with histories of violence to get firearms. Dhingra has advocated for closing business-tax breaks to raise more revenue. She said she’d support a capital-gains tax and roll back the property-tax shift approved in the Washington Legislature this year to fund public schools. The plan — which Democrats reluctantly agreed to — is funded largely by a state property-tax change championed by Republicans. That policy is expected to boost property taxes for homeowners in places like the Eastside, while lowering those taxes elsewhere. Whether Democrats have the votes to push through such legislation is another question. In the recent debate, during a question about gun regulations, a moderator noted that those proposals often haven’t passed the Democratic-controlled House. But Dhingra deflected and pointed across the aisle. “We had very sensible measures last year that did not even come out of the Republican-controlled Senate,” she said.